Yakuza 6: The Song of Life[a] is an action-adventure video game developed and published by Sega for PlayStation 4. The game is the seventh main entry in the Yakuza series, and was released in Japan in December 2016. The English version was released in Southeast Asia in March 2018, and worldwide the following month. Yakuza 6 is an action-adventure game set in an open world environment and played from a third-person perspective. It is similar to that of other Yakuza titles with exploration mixed with arcade style over the top combat. Kazuma Kiryu returns as the main and only playable character and the game features locations of Kamurocho, Tokyo and Onomichi, Hiroshima Prefecture. Several renowned actors voice the characters in Yakuza 6. Among them: Takeshi Kitano as Toru Hirose, Shun Oguri as Takumi Someya, Hiroyuki Miyasako as Tsuyoshi Nagumo, Tatsuya Fujiwara as Yuta Usami, and Yoko Maki as Kiyomi Kasahara, as well as other artists that have participated in the Yakuza series. While recovering from his injuries from the previous game, a hospitalized Kazuma Kiryu is approached by the police, who plan to arrest him for his past crimes. Kiryu chooses not to resist the arrest and willingly spends three years in prison in order to live peacefully with the children he had fostered. Upon being released in 2016, Kiryu discovers that Haruka has disappeared to avoid public scrutiny. Kiryu returns to Kamurocho to search for Haruka, only to find out that she has been left in a coma after a hit and run incident, and that she has a newborn son, Haruto. Unsure whether Haruka will recover from her injuries, Kiryu travels with the baby to Onomichi Jingaicho in Hiroshima to uncover the mystery of what happened to Haruka during his three-year absence. Upon his arrival in Onomichi, Kiryu initially enters into a rocky, but growing friendship with the local Yomei Alliance's Hirose family. During Kiryu's investigation, he learns that elements of the Tojo and Yomei Alliance have been secretly manipulating events behind the scenes in order to maintain "The Secret of Onimichi." The secret is later revealed to be the hidden construction of an abandoned naval Yamato-class battleship at the end of the second World War. Haruka's hit-and-run incident is later to be revealed as part of a retaliatory attack against the Yomei Alliance by the Kamurocho-based Saio Triad. The reason for this attempt on Haruka's life is that Hirose family member Yuta Usami entered a relationship with her and is the biological father of Haruto. Due to the negative connotations of an interracial relationship, and the fact that Yuta is unknowingly the biological second successor to the Saio Triad's leadership, the Saio Triad had deemed Haruto a threat to the Triad's bloodline. During the height of the conflict, Tojo Clan advisor Katsumi Sugai and Yomei Alliance leader Tsuneo Iwami were revealed to be the masterminds behind the conflict, and in an attempt to halt Kiryu's interference, kidnap Haruka and Haruto. With the aid of the Hirose family, a heavily wounded Kiryu successfully defeats Iwami, while Sugai commits suicide. In the aftermath, an unknown politician who serves as the Yomei Alliance's fixer attempts to bribe Kiryu to keep quiet about the battleship's exposure, but Kiryu makes a counter-offer instead. Kiryu demands that the Sixth Chairman of the Tojo Clan, Daigo Dojima, become released from imprisonment in order to end a potential war between the Tojo Clan and the Yomei Alliance. Kiryu also insists that the politician helps him fake his death in order to honor the latter's end of the deal and to let Haruka and her family from the Morning Glory Orphanage live in peace. Yakuza 6 was announced on September 15, 2015 at the Tokyo Game Show during the Sony conference, exclusively for PlayStation 4 and with a release date of "Autumn 2016". Toshihiro Nagoshi of Sega confirmed that more details would be revealed during the rest of the event. A traditional Chinese localisation has been announced for the Asia region. Beat Takeshi has been announced as a character within the game. The game also features New Japan Pro Wrestling wrestlers Hiroshi Tanahashi, Hiroyoshi Tenzan, Kazuchika Okada, Satoshi Kojima, Tetsuya Naito and Toru Yano, who play fictionalized versions of themselves in the game. This is the first game to be developed exclusively for the PlayStation 4, featuring the all new "Dragon Engine.". Yakuza 6 also includes Virtua Fighter 5: Final Showdown, Puyo Puyo, Out Run, Super Hang-On, Space Harrier, and Fantasy Zone as playable games in the form of basic play spots. Virtua Fighter 5: Final Showdown and Puyo Puyo include two-player modes as well. Virtua Fighter 5: Final Showdown is based on Version B of the game and Yakuza 6 is the only official release of this version outside Japan. The demo for Yakuza 6 was released on February 27, 2018 for North America, Europe, and Australia. The US version was pulled from the PlayStation Store after Sega discovered that they accidentally released the full game in that region. The Australian and European demos were pulled from the PlayStation Store the next day, and all the free copies of the game in the US had their digital license revoked. On March 19, 2018, the demo was re-released on the PlayStation Store. Yakuza 6: The Song of Life received "generally favorable" reviews from critics, according to review aggregator Metacritic. The game received a score of 39/40 from the video game magazine Famitsu. The German magazine 4Players gave it 85 out of 100 points. In its first week of release in Japan, it sold 218,168 copies. As of December 23, it has sold 262,760 copies in the region. Combined with the rest of Asia, the game shipped over 500,000 units by December 2016. It was the third best selling video game in the United Kingdom during its European debut week, making it the biggest launch for the series in the UK. As of June 2018, the game has sold nearly 1 million units worldwide, with overseas markets accounting for approximately half of the game's sales. The game was nominated for "Best Storytelling" and "PlayStation Game of the Year" at the 2018 Golden Joystick Awards, and for the Tin Pan Alley Award for Best Music in a Game at the New York Game Awards. ^ "Interview with Yakuza's writer himself Masayoshi Yokoyama!". yakuzafan.com. 2016-08-04. ^ "「龍が如く6」，PS4向けで2016年秋発売決定。初代リメイク「龍が如く 極」は2016年1月21日リリース". 4gamer (in Japanese). September 15, 2015. Archived from the original on September 18, 2015. ^ "Sega Announces HD Remake of Yakuza, and Yakuza 6". Wired. September 15, 2015. Archived from the original on April 11, 2017. ^ "Yakuza 6 announced, exclusive to PlayStation 4". Destructoid. September 15, 2015. Archived from the original on September 17, 2015. ^ "Yakuza 6 Announced For PS4". GameSpot. September 15, 2015. Archived from the original on September 25, 2016. ^ a b c "TGS 2015: Yakuza 6 Announced". IGN. September 15, 2015. Archived from the original on January 18, 2017. ^ "Yakuza 6's Delay Only For US And Europe, English Version Still Set For Release In Asia March 20th – Gamer Matters". gamermatters.com. Archived from the original on 2018-04-25. Retrieved 2018-03-21. ^ "Yakuza 6: The Song of Life". PlayStation™Store. Archived from the original on 2018-04-25. Retrieved 2018-03-21. ^ Square, Push (2018-03-20). "Yakuza 6's Release Roll Out Continues to Be a Mess". Push Square. Archived from the original on 2018-04-25. Retrieved 2018-03-21. ^ "PSX 2016: Yakuza 6 And Yakuza Kiwani Coming To The West". IGN. December 3, 2016. Archived from the original on January 18, 2017. ^ Game, Yakuza (2 February 2018). "An important update on Yakuza 6 : The Song of Lifepic.twitter.com/8MILlBPI4x". @yakuzagame. Archived from the original on 4 February 2018. Retrieved 2018-02-02. ^ "Meet the Voice Actors of Yakuza 6's Cast". twinfinite.net. April 17, 2018. Archived from the original on February 14, 2019. Retrieved February 14, 2019. ^ "Yakuza 6 has very good faces". criticalhit.net. May 8, 2018. Archived from the original on February 14, 2019. Retrieved February 14, 2019. ^ "New PS4-Exclusive Yakuza 6 Trailer Features Famous Japanese Actors". gamespot.com. July 26, 2016. Archived from the original on February 14, 2019. Retrieved February 14, 2019. ^ "Sony Computer Entertainment Japan Asia unveils its strong hardware and software line-ups for the coming holiday season". PlayStation Asia. September 16, 2015. Archived from the original on July 21, 2016. ^ "First look at Yakuza 6 shows Beat Takeshi's character". Gematsu. September 28, 2015. Archived from the original on October 2, 2015. ^ 新日本プロレスリングの人気選手が神室町最大のギャングに？！オカダ、棚橋、内藤ら6選手がPlayStation®4専用ソフト『龍が如く６ 命の詩。』に出演決定！. New Japan Pro Wrestling (in Japanese). September 16, 2016. Archived from the original on September 16, 2016. Retrieved September 16, 2016. 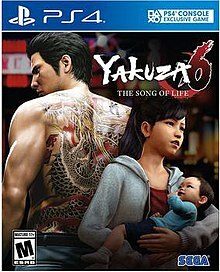 ^ "Yakuza 6: The Song of Life Game : PS4". Retrieved 21 Feb 2019. ^ Romano, Sal. "Yakuza 6 adds "Live Chat" play spot [Update: Virtua Fighter 5: Final Showdown and Puyo Puyo]". Gematsu. Archived from the original on 2016-09-06. Retrieved 2016-09-06. ^ Plunkett, Luke. "Sega Accidentally Released Yakuza 6 For Free". Kotaku. Archived from the original on 2018-02-28. Retrieved 2018-02-28. ^ "Sony Revokes All Free Copies Of Yakuza 6 On PS4, No Penalties Will Be Given To Owners". GearNuke. 2018-03-01. Archived from the original on 2018-03-01. Retrieved 2018-03-01. ^ PlayStation (19 Mar 2018). "Good news, Yakuza fans! The Yakuza 6: The Song of Life demo is back: Get a head start on the conclusion of Kiryu's story — your progress will carry over when the full game launches April". @PlayStation. Archived from the original on 2018-04-25. Retrieved 2018-03-19. ^ a b "Yakuza 6: The Song of Life Reviews". Metacritic. Archived from the original on 16 March 2018. Retrieved 24 March 2018. ^ Glagowski, Peter (15 March 2018). "Review: Yakuza 6: The Song of Life". Destructoid. Archived from the original on 18 March 2018. Retrieved 24 March 2018. ^ "Yakuza 6: The Song Of Life". Edge. Future plc (317): 108–110. April 2018. ^ Patterson, Mollie (15 March 2018). "Yakuza 6: The Song of Life review". Electronic Gaming Monthly. Archived from the original on 20 March 2018. Retrieved 24 March 2018. ^ a b Romano, Sal. "Famitsu Review Scores: Issue 1461". Gematsu. Archived from the original on 2016-12-01. Retrieved 2016-12-01. ^ Cork, Jeff (15 March 2018). "Yakuza 6: The Song of Life review". Game Informer. Archived from the original on 23 March 2018. Retrieved 28 March 2018. ^ Faulkner, Jason (15 March 2016). "Yakuza 6 Review: Like a Dragon". Game Revolution. Archived from the original on 15 March 2018. Retrieved 24 March 2018. ^ Tran, Edmond (16 March 2018). "Yakuza 6: The Song of Life Review". GameSpot. Archived from the original on 18 March 2018. Retrieved 24 March 2018. ^ Avard, Alex (15 March 2018). "Yakuza 6: The Song of Life Review: "Sweet, Sagely, And Surprising Subtle In Its Storytelling"". GamesRadar+. Archived from the original on 15 March 2018. Retrieved 28 March 2018. ^ Ogilvie, Tristan (15 March 2018). "Yakuza 6: The Song of Life Review". IGN. Archived from the original on 18 March 2018. Retrieved 24 March 2018. ^ Parkin, Jeffery (15 March 2018). "Yakuza 6 review". Polygon. Archived from the original on 18 March 2018. Retrieved 24 March 2018. ^ Sato (December 16, 2016). "This Week In Sales: Yakuza 6 Pummels Its Way To The Top". Siliconera. Archived from the original on December 17, 2016. Retrieved December 16, 2016. ^ Sato (December 23, 2016). "This Week In Sales: Yo-kai Watch 3 Cooks Up Its Sukiyaki Version". Siliconera. Archived from the original on December 24, 2016. Retrieved December 23, 2016. ^ "Yakuza 6 Crosses 500,000 Shipments In Japan and Asia, Franchises Sees 9 Million in Sales Worldwide". Segalization. Archived from the original on 21 December 2016. Retrieved 16 January 2017. ^ "TOP 40 ENTERTAINMENT SOFTWARE, WEEK ENDING 21 April 2018". Chart-Track. Archived from the original on April 23, 2018. Retrieved April 23, 2018. ^ Mason, Damien. "God of War and Yakuza 6 dominate the UK charts". Kitguru. Archived from the original on 23 April 2018. Retrieved 25 April 2018. ^ "Sarah Wellock on Twitter". Archived from the original on April 25, 2018. Retrieved April 25, 2018 – via Twitter. ^ "Yakuza 6 Sales Nears 1 Million Mark Worldwide". PlayStation LifeStyle. June 5, 2018. ^ Hoggins, Tom (24 September 2018). "Golden Joysticks 2018 nominees announced, voting open now". The Daily Telegraph. Retrieved 6 October 2018. ^ Sheridan, Connor (16 November 2018). "Golden Joystick Awards 2018 winners: God of War wins big but Fortnite gets Victory Royale". GamesRadar+. Retrieved 17 November 2018. ^ Keyes, Rob (3 January 2019). "2018 New York Game Awards Nominees Revealed". Screen Rant. Retrieved 7 January 2019. This page was last edited on 22 March 2019, at 02:58 (UTC).